The .600 Nitro Express was the largest of the classic safari cartridges of the golden age of big game hunting in Africa and India. The ammunition was so expensive that it came in boxes of five, and the rifles made for it were very few. 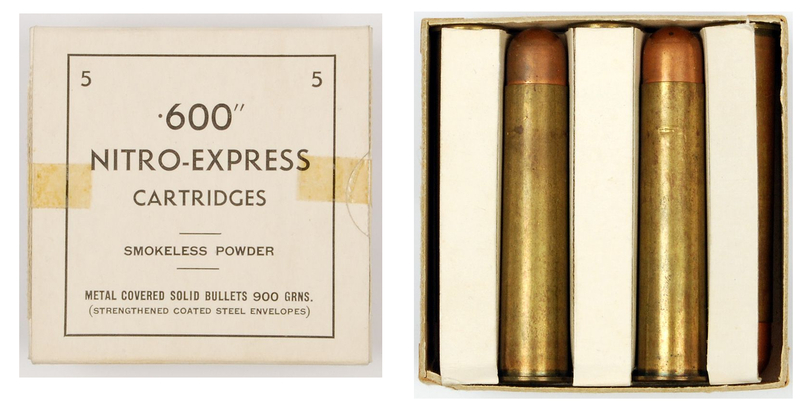 .600 Nitro Express ammunition was expensive and was sold in packets of just five cartridges. (Picture courtesy waffenboerse.ch). The only .600 Nitro Express I’ve had the opportunity to handle was a Holland & Holland double rifle made for Indian royalty, it weighed just over 16lb although it was so lively in the hands it felt like it weighed 11lb-12lb. But it was one of very few .600 Nitro Express rifles Holland & Holland made. The .600 Nitro Express was perhaps the rifle for the man who had everything and just wanted the biggest he could get. 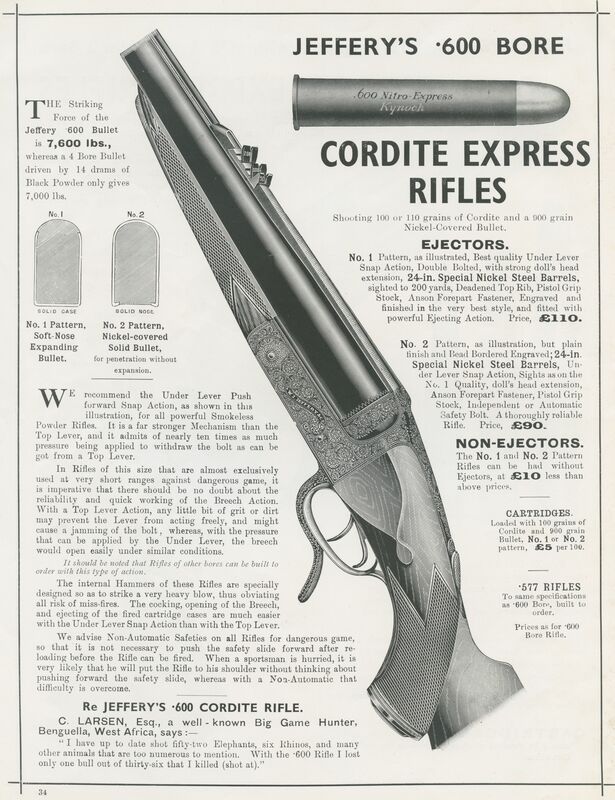 The .600 Nitro Express was made in two loadings; a 900 grain bullet with either 100 grains of Cordite for a muzzle velocity of 1,850 fps or 120 grains of Cordite for a velocity of 1,950 fps. There were two bullet styles made, a copper or nickel plated steel full metal jacket or a copper or nickel plated jacketed soft point, some loadings with four longitudinal grooves in the jacket to ensure rapid expansion. The latter loading was designed to be an excellent tiger stopper. Much has been written about the knock-down power of the .600 and with it sending a 900 grain bullet downrange with either 100 grains of Cordite behind it to generate a muzzle velocity of 1,850 fps or 120 grains for 1,950 fps we can well believe that these rifles delivered an abundance of power at both ends. 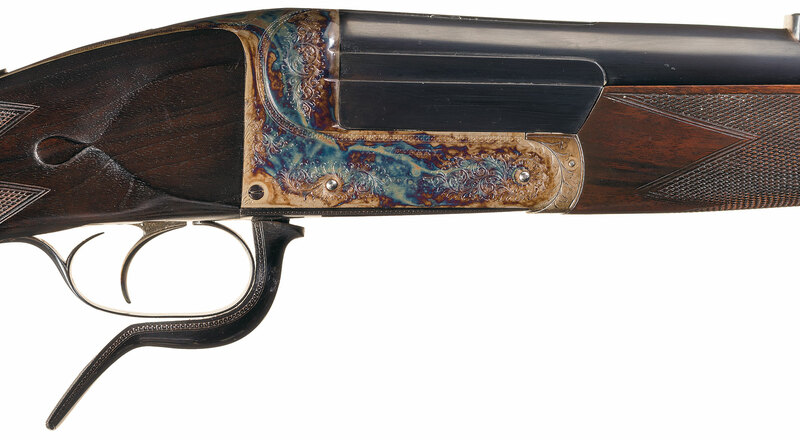 Such was the reputation of the .600 Nitro Express that during the First World War, when the British found themselves being shot at by German snipers who were hiding behind heavy plate steel hides they decided that they would have a go at “Jerry” with suitable big game rifles. 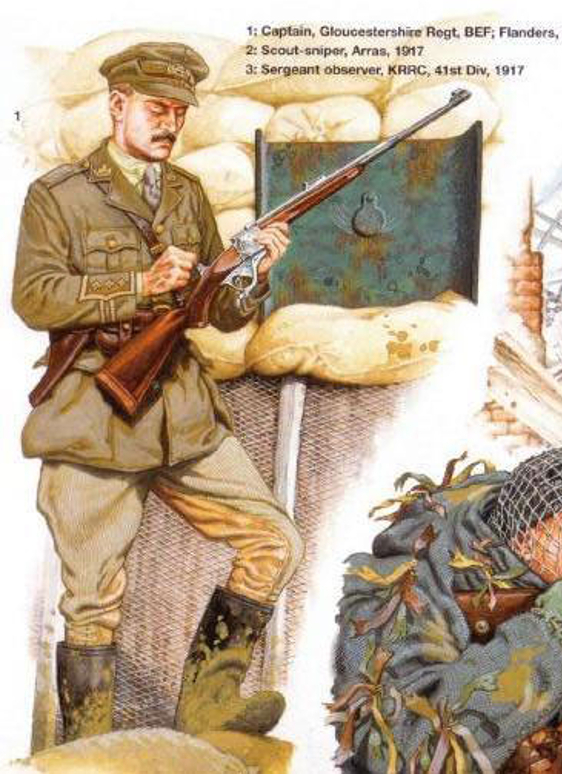 British officer during the First World War with a .600 Nitro Express single shot sporting rifle. The .600 Nitro Express was a caliber of choice and various British gunmakers donated suitable rifles. When the first of these rifles arrived at the front the first man to try shooting one from the standard military prone position immediately sustained a broken collar-bone, such was the recoil. So the British snipers learned to shoot the big .600 NE rifles from standing or kneeling, and had great success punching holes in “Jerry’s” plate steel hides or even knocking them over, with most satisfactory results on the enemy sniper behind the steel barrier. This proved to be a sporting way to counter what the British regarded as “dashed unsporting” behavior on the part of their adversaries. W.J. Jeffery advertisement for their .600 Nitro Express rifles. Jeffery made both single shot and double rifles for this cartridge. This advertisement advocates the use of the under-lever action for heavy caliber dangerous game rifles. (Picture courtesy theexplora.com). In the advertisement above W.J. 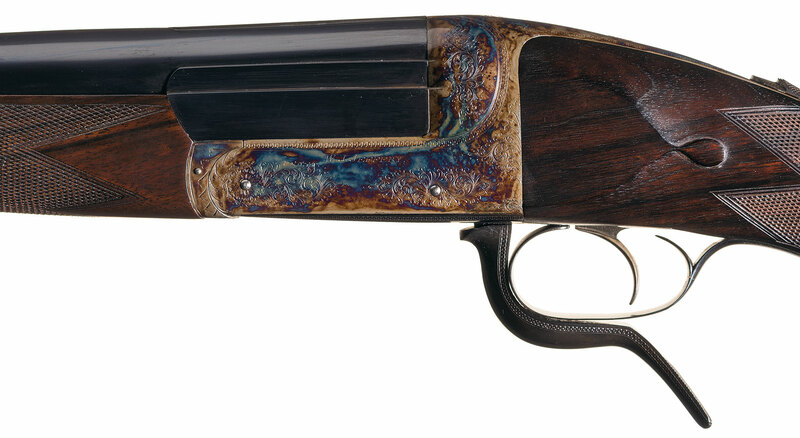 Jeffery state their preference for the under-lever action for dangerous game rifles because the under lever rifle provided more reliability against dust and dirt in the action. They made both double rifles and single shot rifles with this type of action, the single shot being lighter and somewhat less expensive. W.J. Jeffery under-lever single shot rifle built on an Anson & Deeley action. The rifle pictured above is a W.J. Jeffery under-lever single shot built on an Anson & Deeley action, similar to the double rifle in the advertisement above. When made in a single shot rifle a .600 Nitro Express would be somewhat lighter than a double, the Jeffery single shot pictured above weighs 13 lbs. 9 oz. and is proofed for the slightly less powerful 100 grains of Cordite loading. The lighter weight means that this rifle could be carried by the hunter rather than needing to be entrusted to a gun-bearer and only taken up when needing to shoot. Recoil would of course be more noticeable from the lighter rifle, but in the face of a charge by something determined to bite, gore or stomp the hunter is unlikely to notice recoil. This W.J. 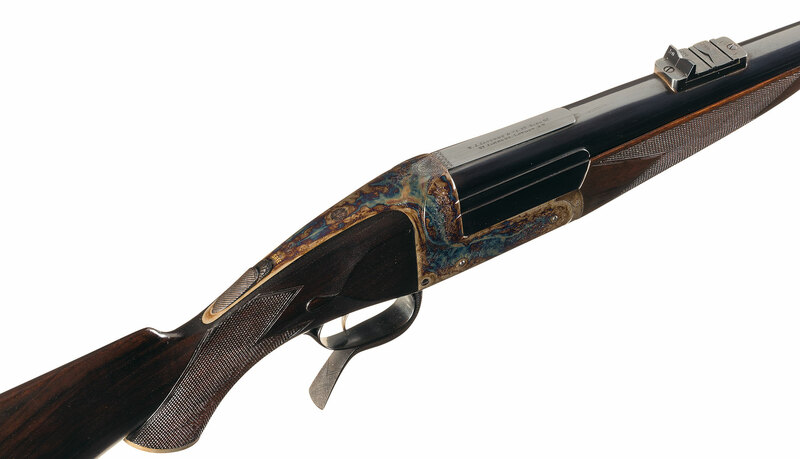 Jeffery .600 Nitro Express rifle has 26½ inch barrels which makes it a very handy length. Length of stock is 14¼ inches. Barrel taper is designed to keep the weight of the rifle “between the hands” and should serve to make it lively and instinctively point-able. This rifle was made in 1903 and was the second of the three of these rifles Jeffery made. The rifle has a minimalist classic set of open “V” express sights with a fixed leaf for 50 yards and two folding leafs, one for 100 yards and the other for 200 yards. The stock design looks to be appropriately straight with a classic recoil pad to ensure shooter comfort. The safety catch is automatic which is interesting as automatic safety catches were advised against by Jeffery for dangerous game rifles. So we can reasonably assume the customer who ordered the rifle had a strong preference for an automatic safety. The automatic safety catch feature can normally be disabled by a competent gunsmith. Right side view of the Jeffery single shot .600 NE rifle. This W.J. Jeffery .600 Nitro Express single shot rifle is coming up for sale by Rock Island Auction on April 14th, 2018. Left side action view of the Jeffery .600 NE single shot rifle. This is an intelligently designed .600 Nitro Express rifle typical of the big-game rifles of the golden era of African and Asian hunting, and also of the rifles used for counter sniper work during the First World War. It is a historical piece of significance: and it is a rifle that could be used on safari to re-live the dangerous game hunting of old. With appropriate bullet choice this rifle could be used on any of the “Big Five” of Africa and, as long as the hunter does his/her part and places the bullet where it needs to go, with most satisfactory results. (Pictures of the W.J. Jeffery .600 Nitro Express Rifle courtesy Rock Island Auction).